Maintaining an hourglass figure is every woman’s dream, isn’t it? Every other TV channel and newspaper comes up with attractive ads to draw the attention of the women-folk. While actresses like Kareena Kapoor and Amy Jackson maintain zero figure, many of us struggle to maintain a healthy weight. Some people prefer going to Gym to lose weight, but, they stop going after some time and look for an alternative method. Some prefer artificial methods like surgery, liposuction, etc., without knowing the side effects, which are, sometimes, life threatening. In spite of all the efforts, they fail to lose the extra flab. Whom can we blame but ourselves? To solve your problem, seek the help of Ayurveda. 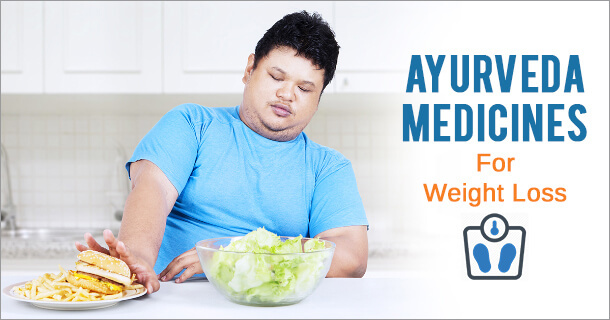 Yes, Ayurveda helps in identifying and treating the root cause of the problem, whereas the medicines suggested will help to provide a permanent solution for weight loss. Usually, the medicines suggested in Ayurveda are based on one’s body type, problems, symptoms and various other factors. Read the blog to see several effective Ayurveda medicines for weight loss, which although is not a quick fire solution, it still is effective and aids in losing weight. These suggested medicines are blends of special herbs that reduces cravings for fatty foods, enhances your body metabolism and helps drain the fatty cells through the lymphatic system. Reduces the cholesterol level and corrects the energy imbalances in the body, the important factors associated with fat accumulation. Helps reduce the intake of carbohydrate and fat and controls craving for sweets and food. Ginger: Start your day by consuming a fresh ginger. It helps to increase your body heat and aids in burning fat. Lemon & Honey: You can consume lemon with honey in warm water. This Ayurveda combination detoxifies the body, reduces appetite and aids in weight loss. Cabbage: Cabbage can be consumed after cooking or even as raw as it boosts the burning of fat. You can easily make cabbage a substitute for your evening snacks. Pepper: Adding a pinch of pepper powder to your food or lemon juice will help to aid your weight loss mission. Fasting: For efficient functioning of digestive system and for detoxification, fasting once a week is recommended in Ayurveda. During this time, you can have vegetable soups, green tea or lime water. Get Rid Of Ama: Consuming foods that aids in eliminating Ama is recommended in Ayurveda. Ama is the byproduct of incomplete digestion, which when accumulated triggers weight gain and clogs lymph channel. Apart from this, you can also use natural and healthy substitutes like licorice extract, honey, and rock-salt to make your weight management task a reality.